Get ready for triple-digit heat again Friday in parts of the inland county. On Thursday, residents saw a wild range of weather. What started out as a sunny, muggy day turned into a rainy one with thunderstorms, lightning strikes and flash flood warnings issued in the afternoon. For Friday, forecasters expect lower humidity levels which could keep us from dealing with thunder and lightning. We're starting off even warmer than yesterday. 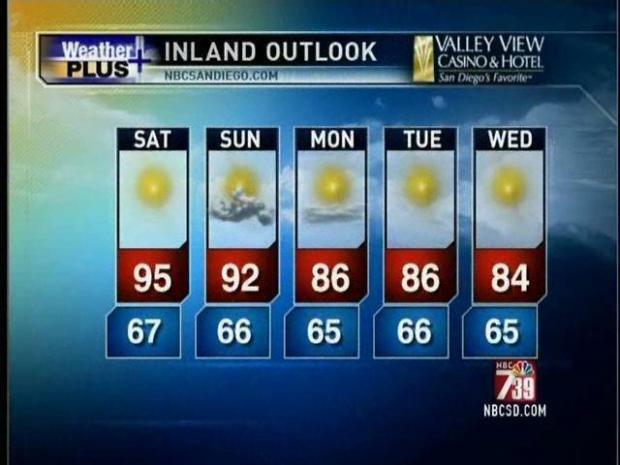 NBC San Diego forecaster said we could see warmer temperatures in the afternoon than 24 hours ago. If you headed to the beach to beat the heat Thursday, no doubt you noticed that the warm air was quickly displaced by the chilly ocean. The water temperature was in the low sixties, still a little chilly. Whitney Southwick gives you the Morning Forecast for Friday, July 16, 2010. At Mission Beach, a lot of people braved the water and said it wasn't too bad. But others said, no way. "The water is so cold, it's freezing," said one tourist. "It feels like ice cubes and it hurts!" At this time of year, water temperatures in San Diego should be around 70 degrees. Lifeguards say the colder temperatures may be thanks to some strong winds earlier in the week bringing up colder water. They expect the water to warm up in the next few days.